PC200W is a free starter software package designed for first-time users or users with simple data communication needs; it provides basic tools (clock set, program download, monitor data, retrieve data, etc.). PC200W supports direct connections between a PC and data logger (no telecommunications or scheduled data-collection support). After a program is created with our Short Cut Program Generator (included), PC200W is typically used to download the program to the data logger. PC200W was designed expressly for the beginning user so a manual is not necessary. Context-sensitive help is available throughout the program by pressing F1. Note: PC200W only supports direct communications. 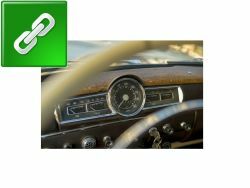 Telemetry requires either LoggerNet or PC400 Datalogger Support Software. LoggerNet also supports scheduled data collection. For more information, contact Campbell Scientific. PC200W collects and stores data in comma-separated files on your PC. 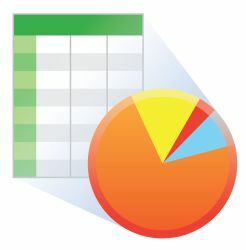 It includes View Pro, which displays data files in tabular or graphical form. For mixed-array data loggers, a simple Split program is included that separates arrays in a data file into separate files. CardConvert is used to convert and save binary data from a PC Card, CompactFlash card, or microSD card. Our CR5000 and CR9000X dataloggers store data on a PC Card via their on-board PCMCIA card slot, and store data on a CompactFlash card via the CF1 CompactFlash Adapter. Our CR1000 and CR3000 dataloggers store data on a CompactFlash card via the CFM100 CompactFlash Module or NL116 Ethernet Interface and CompactFlash Module. Our CR6 and CR1000X dataloggers store data on a microSD card. PC200W includes Short Cut for creating simple data logger programs. Programs created with the CRBasic Editor or Edlog can be sent to the data logger using PC200W. Download Short Cut Program Generator at no charge. 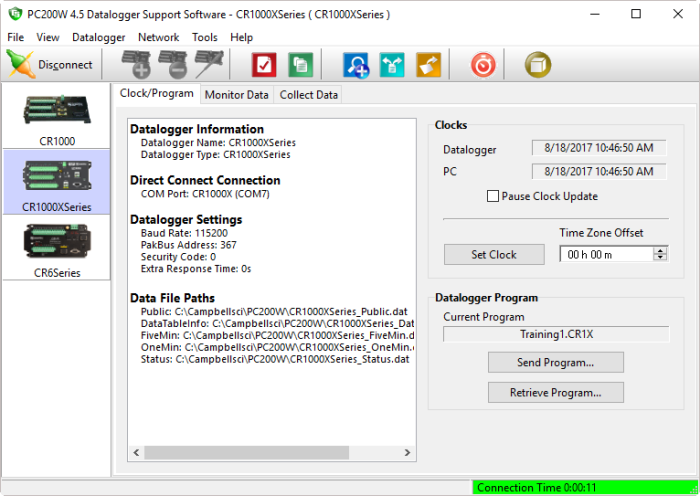 CRBasic is a program editor included in LoggerNet and PC400 Datalogger Support Software. 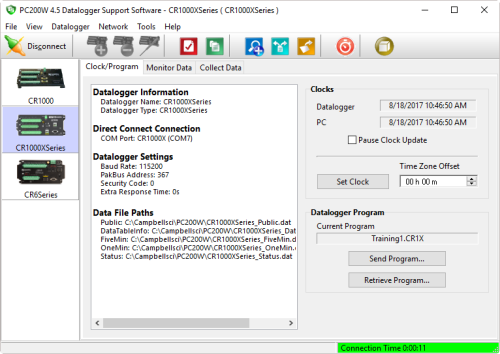 Edlog is a program editor included in LoggerNet and PC400 Datalogger Support Software. PC200W is copyrighted software. 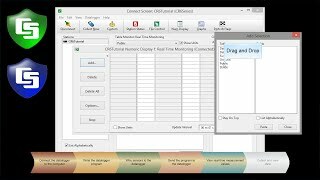 Campbell Scientific distributes this software free of charge to enable users to work with Campbell Scientific data acquisition equipment. PC200W may be freely copied; however, neither PC200W nor any of its files may be sold or included in any other software or altered in any way without prior permission from Campbell Scientific, Inc.
Campbell Scientific, Inc., does not warrant that the software will meet licensee’s requirements or that the software or documentation are error free or that the operation of the software will be uninterrupted. Campbell Scientific, Inc., is not responsible for problems caused by computer hardware, computer operating systems or the use of Campbell Scientific, Inc.’s software with non-Campbell Scientific, Inc. software. All warranties of merchantability and fitness for a particular purpose are disclaimed and excluded. Campbell Scientific, Inc., shall not in any case be liable for special, incidental, consequential, indirect, or other similar damages even if Campbell Scientific, Inc., has been advised of the possibility of such damages. Campbell Scientific, Inc., is not responsible for any costs incurred as result of lost profits or revenue, loss of use of the software, loss of data, cost of re-creating lost data, the cost of any substitute program, claims by any party other than licensee, or for other similar costs. Licensee’s sole and exclusive remedy is set forth in this limited warranty. Campbell Scientific, Inc.’s aggregate liability arising from, or relating to, this agreement or the software or documentation (regardless of the form of action; e.g., contract, tort, computer malpractice, fraud and/or otherwise) is limited to the purchase price paid by the licensee. Only direct connection between the PC and data logger is supported (telecommunications are not supported and neither is scheduled data collection). How can it be determined in PC200W which units of measurement are being used for a particular parameter? Units cannot be displayed in the Monitor Data tab of PC200W. When data is collected using PC200W, the units, if known, are contained in the header of the data file. They can be displayed in View by selecting the View | Show Full Header menu item. Is there a software upgrade for the PC200W program? The latest version of PC200W can be downloaded free-of-charge from the Downloads area of the PC200W product page. How can control ports be configured so that they can be toggled using the port dialog in PC200W? The retired CR500 and CR510 have two control ports; however, only one of the ports, control port 1, can be configured for output. Therefore, control port 2 cannot be toggled on or off. It is included on the display so that its status can be monitored. Can a CSI file be edited using PC200W? 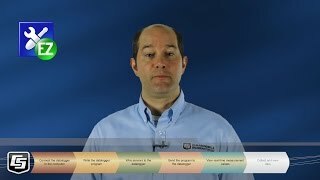 Does PC200W allow adding two different sensors to a multiplexer? If so, how? After a multiplexer has been added in Short Cut (SCWin), all the sensors that can be added to the multiplexer are listed in the Available Sensors and Devices tree. Short Cut only allows two different sensors to be added to a multiplexer if they are both measured using the same type of measurement (that is, single-ended, differential, half bridge, 3-wire half bridge, etc.). After a sensor is added to the multiplexer, the Available Sensors and Devices tree lists only those sensors that require the same type of measurement as the first sensor added. Are there instructions as to how to download, view, and print daily weather records using PC200W? Data records are collected (downloaded from the data logger to the PC) from the PC200W Collect Data tab. The records can be viewed and printed by selecting View from the PC200W toolbar or the Tools menu. What is the difference between PC208W and PC200W? PC208W is a retired data logger support software package. It was replaced by LoggerNet in 2004. PC200W is the current free starter software package. Can PC200W be used to clear data from a data logger that does not have a keyboard? Connect to the data logger, and open the Station Status window. On the Table Fill Times tab, select the tables to clear. Press the Reset Tables button. Does PC200W come with device configuration software, or is LoggerNet needed? The Device Configuration Utility is included with PC200W. It is also available free-of-charge as a stand-alone product on the Downloads page of our website. Can PC200W operate on a 64-bit system?